A slow, gentle pitter patter now mildly resounds from the adjacent room, becoming more pronounced before two shadowy forms finally arrive at our bedside. Our twin boys--Kyle and Colin--disrupt this blissful reverie--each laying claim to a separate, synchronous appeal: “Breakfast daddy...water momma.” As I walk downstairs with my wife and boys, the lingering effects of this southern Bretagne serenade softens the jolt of our early rousing. In a few minutes, a strong cup of hot French coffee will finish what nature started through that open window. And so, for this Verona, NJ quartet, yet another day beckons here amidst the rolling, green, fertile fields of Western France. 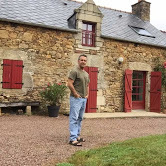 A few dozen, equally rhythmic mornings have thus announced themselves as we enter the third week of a 6-month teaching sabbatical in this bucolic corner of southern Bretagne in the shadow of the Vilaine River. Allen, our retired neighbor here in Cado, wears a mop of grey, unruly hair, and points proudly one early afternoon in the direction of that same river while we share a local Bretagne beer: “Bretagne ends just beyond the river,” he says in French, a proud smile and a full, grey goatee completing a face now mildly etched by the hands of age. A few miles beyond the Vilaine--a half-mile or so from our present perch in comfortable lawn chairs--begins the Pays de la Loire--another of France’s official 22 administrative regions that are all stitched together like a carefully arranged jigsaw puzzle--each area offering distinctive linguistic quirks, culinary delights and cultural gems. For the next two months, it’s Bretagne--this westernmost of France’s regions,that we call home. I struggle to apply the word “village” to this collection of 7 houses in Cado--a somnolent patch of Bretagne farmland rolling down to the banks of the Vilaine where cows, horses, goats and chickens far outnumber the dozen or so residents--a figure that has now jumped significantly with our 2-month tenancy. Yet, according to Louis, the owner of our house who lives with his wife Maite in an equally charming home attached to ours, it is indeed just that—a village. While officially belonging to the administrative commune of adjacent Beganne, Cado still maintains its autonomy as a French village--with just 7 houses. Yet, those few houses bear none of usual trappings of “une vrai village”. No bakery, post office, mayor’s office or restaurant. There’s no quaint centre-ville. No roundabouts. No pubs. No markets. For these more-traditional staples, a short five to 10 minute drive down D20--the nearby country road--leads to the slightly larger, yet still subdued and quintessentially French villages of Beganne, Allaire, Peaule, and Muzillac, among others. These places seem--visually at least--to more seamlessly meet the threshold of an actual village. A still further push east brings one to the slightly more bustling Bretagne town of Redon, where the pulse of life elevates a bit with a livelier town center and a commercial zone where we have our choice of several markets to do our shopping. Every resident of Cado knows each other and in our brief few weeks here, we have met more than half its population. Colette and Michel offer to sell us fresh eggs from their chicken coop, which sits over a small hill on an adjacent property. A peek over their fence reveals 7 rushing chickens making the rounds of their modest pen, pecking the ground while darting this way and that. Louis and his wife Maite invite us to dinner one evening. Over a multi-course meal of wine, appetizers, quiche, cheese, pastries and coffee, I ask him how long it took to complete what is now our comfortable, two-bedroom loft-style house almost completely covered in original, early 19th Century stone: “Four years,” he says in French, sharing a warm, infectious smile. At 76, he is a bespectacled, gentle, slender man with a few stubborn strands of grey hair remaining. He slowly shakes his head while reflecting on the massive, multi-year undertaking in transforming what was a barn full of animals in 2003 into a fully functioning house today. He did some of the work himself, but had help from friends and contractors as well. He shows my wife Emily and me a picture of the empty, beam-strewn and wood-splintered mess that was the interior of the barn before renovations began in 2003. In the photo, his wife Maite stands bravely in the dilapidated, cavernous shell that appears to teeter perilously close to collapse. That photo stands in dramatic contrast to the clean, tastefully designed modern house that we now happily occupy. Three of the seven Cado homes are clustered together and share a gravel driveway that opens to three different, rarely trafficked, country roads. A right outside our driveway is a turn in the direction of the Vilaine River--which flows lazily a half-mile further down a mildly sloping field on its roughly 12 mile course towards the Atlantic A few steps off our property in that same direction is the beginning of the grassy path that leads to the 15th Century ruins of the Chapel of Saint Cado. At the outset, the narrow path is bordered on each side by a fence that contains on one side a brown horse, who, on this day, is feasting on a bounty of grass. 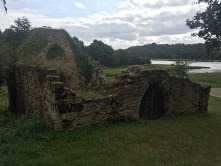 Constructed in 1423, the Chapel of St. Cado gains its name from one of the most notable Welsh saints, who emigrated from Wales to this corner of Bretagne in the 5th Century to pledge his allegiance to Christ and avoid fighting in his father’s army. 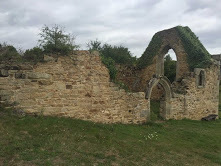 As I enter a side opening, I marvel at the antiquity of these 15th century ruins, nestled quietly on this breezy hillside steps from the Vilaine and a scant half-mile from our home. And so, as I turn for my brief walk home at mid-afternoon, the remains of the lonely Chapel of St. Cado very quietly, humbly, and with little fanfare, sleepily fade out of view for that next fortunate wanderer to one-day encounter.